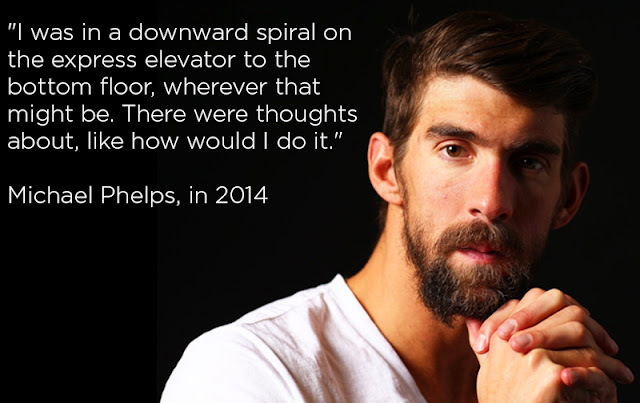 A few thoughts....: Robin Williams committed suicide 2 years ago - what if Michael Phelps did too? The news about Robin Williams was so shocking at the time. How could someone so full of life and who created so much happiness in others be depressed? The good news, is that it became one of the turning points in our understanding and compassion for mental health issues. Beyond the laughter, that will be his greatest and most enduring gift to humanity. 10th leading cause of death in the U.S.
Over 1 million attempt suicide each year - that is a large city. Most people didn't think about this morbid anniversary because we are preoccupied with the 2016 Olympic Games in Rio. Be good to each other - and watch out for your family, friends and neighbors.